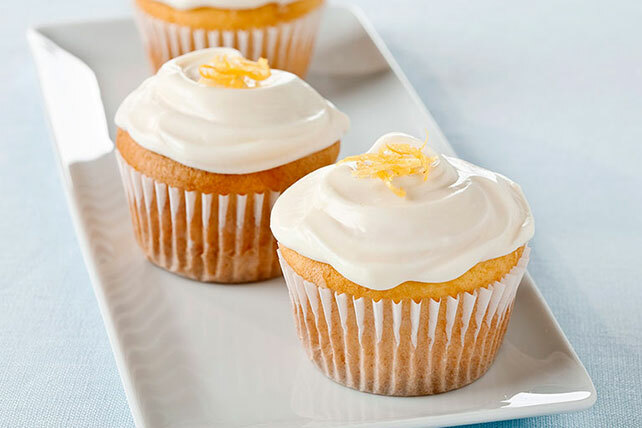 Bring out some citrus zing with our Lemon-Cream Cheese Cupcakes. These cream cheese cupcakes are full of lemon flavor and are topped with a zesty frosting. Beat first 5 ingredients in large bowl with mixer until blended. (Batter will be thick.) Spoon into 24 paper-lined muffin cups. Bake 21 to 24 min. or until toothpick inserted in centers comes out clean. Cool in pans 10 min. Remove to wire racks; cool completely. Beat cream cheese, butter and lemon juice in large bowl with mixer until blended. Gradually beat in sugar until blended. Spread onto cupcakes. Blend 1 tsp. lemon zest into frosting before spreading onto cupcakes.